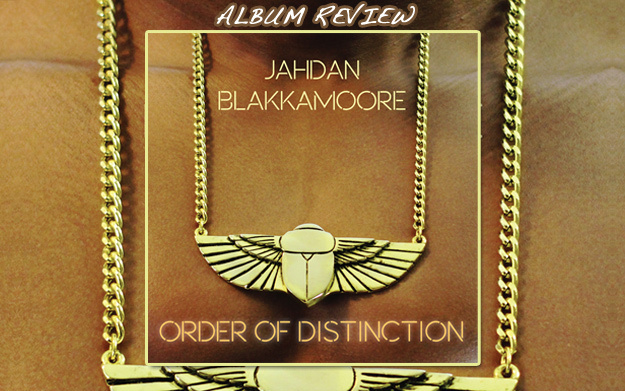 Five years after his seminal album Babylon Nightmare, Jahdan Blakkamoore presents a follow-up album, again with the quality-guaranteeing Lustre Kings Productions sticker on it. It is the third studio album by Jahdan, who had started his career in the late 1990s as just Jahdan. Born and raised in Guyana, Jahdan Blakkamoore moved to Brooklyn at the age of six. He is equally at ease in hip hop and reggae and has worked with numerous projects of both genres, resulting in collaborations with such various artists as Dead Prez, Kabaka Pyramid, Major Lazer, Matisyahu, Mavado, Popcaan, Pressure Busspipe, Smif-N-Wessun, and Snoop Dogg, among others. About half of the 14 songs on Order Of Distinction have been penned by PaperStars, the songwriting and production duo that consists of Jahdan himself and Andrew “Moon” Bain of Lustre Kings. For most of the other tracks, Zion I Kings draw responsible, the family of producers consisting of members of Zion High Production, I Grade Records, and Lustre King Productions. Furthermore, the New York master of electronic music Nate Mars contributed Faith, and Dre Skull provided Sky’s The Limit. It goes without saying that all productions are tricked out in details and as shiny as they could be. The number of producers involved results in an album that has the feel of a compilation, on the other hand Jahdan gets an opportunity to show his skills on a broad scale of different riddims. Order Of Distinction fuses urban American styles with Afro-Caribbean music, has a distinctly urban touch and sounds very 2015. Live-recorded instruments meet digital elements galore to form a genuine sound that draws from various developments of contemporary music. Jahdan sings, toasts and raps, being at ease with the riddims provided at any time. Almost two decades of experience as a professional artist result in crisp songwriting and outstanding vocal skills. Six guest artists are on board. Lutan Fyah joins Jahdan for Cold World, while Kabaka Pyramid supports him on the dubstep-infused For The Children. Pressure Busspipe lends his voice to Cycles Of Life, a smooth and clean modern roots tune. Together with British rapper Lady Leshurr and Jamaican-Canadian Melodic Yoza, Jahdan celebrates Ting Tun Up!. The Chicago-based hip hop group Illuminati Congo joins in for Queen Of The Forest, an affectionate ode to Mary J that could well stick around for the next few years, until she’s finally legal anywhere. But Jahdan Blakkamoore doesn’t need feature guests to shine, as tunes like Ready Mi Gone, Everything I Love, and Come Back Around so strongly indicate. He’s on top of the game and definitely one of the most versatile and thrilling artists of the moment.